What a fabulous course! I’m so sorry its over for another year. Such great ideas which I thoroughly enjoyed tasting and will certainly be cooking again over the coming months. I must now sort out a date for the summer session! Well what a BLAST! Dear Judy, thank you Jane and all your staff for making, what seems to have been, a blast of a party. The phone calls/emails keep coming and everyone, but everyone is saying how much they loved, loved your food. Thank you for making it such a great day and for taking all the pressure away! 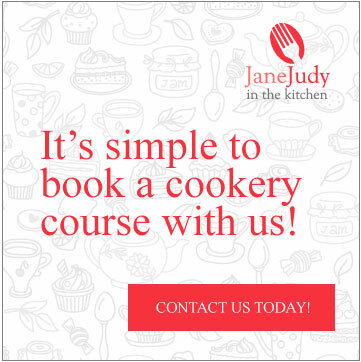 I have been going to Jane and Judy’s cooking demonstrations with my Mum at Christmas and in the summer for more years than I can remember. Jane and Judy are both friendly and approachable and are happy to answer any questions. The menus are always varied and absolutely delicious and form the foundation of the many dinner parties I’ve had at home, as well as cooking for the family. Both Jane and Judy have given me the confidence to tackle the dishes myself and have had a very real influence on the cook that I am today. The demonstration sessions are always great fun; the really fantastic bit is that you get to taste a bit of everything that is cooked as well as having tea and coffee with a huge slice of delicious homemade cake!! Not to be missed in my opinion and it gets Christmas and summer entertaining off to a flying start! I know I am speaking for everyone on the course. We so enjoy the time spent with you when you are demonstrating the various delicious dishes. However we also appreciate the time you spend behind the scene in planning, shopping, weighing out ingredients, preparing certain vegetables etc etc. This must take hours and we thankyou for all your hard work. We are also aware of all that Sarah does for you too ( in Bromley). I am very much looking forward to your next demonstration and tasting. Our Autumn and Christmas demonstration classes are now available!